Wow! 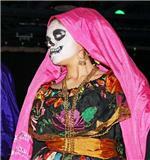 I thought Mexico’s version of Halloween at Harbourfront was fantastic when I saw it a couple years ago. It had dancers with skulls painted on their faces. Harbourfront will celebrate Day of the Dead this year on November 6 and 7. There’s no trick or treating in Mexican tradition. It’s a serious time for remembering deceased friends and relatives with prayers and offerings of favorite foods. Traditional Mexicans believe that spirits of the dead return to earth on this occasion. For details and times at Harbourfront, click on “What’s On” at http://www.harbourfrontcentre.com/ and then its calendar for November 6 and 7. Its fantastic program offers free Mexican food, films, dance, music and dance. The Mexican Consul-General’s office let us know about three other free Toronto celebrations of the Day of the Dead. On October 29, 30 and 31, the Chocosol Cacaoloft at 6 St. Joseph St. House (near Yonge and Bloor) has short programs (donations welcome). It includes a lesson in corn tortilla-making. For information, telephone: 416-023-8836. Web-site. http://www.6stjoseph.ca/. On October 31, the Artscape Wychwood Barns from 2-7pm has dances, crafts, and sugar skulls. It’s at 601 Christie St. (near St. Clair Avenue.) Contact: sape_ich@hotmail.com . The Gardiner Museum at 111 Queen’s park has a program that includes making clay skulls, music, food, and films. Phone 416-586-8080. The Day of the Dead event at Artscape Wychwood is on Sunday the 30th, not Monday the 31st! Hi Roman, Thanks for the update. Our Day of the Dead Blog was a description of the 2010 event. I’ve now posted the 2011 event on http://www.TorontoMulticulturalCalendar.com and will mention it on our Twitter. Can you please put us on your mailing list for events like this in the future. ruthglor@hotmail.com. Thanks.